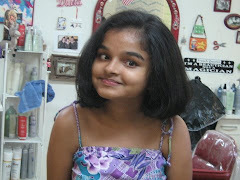 With the launch of the new Dove Nourishing Oil Care Range, Dove and IndiBlogger present the “Love your Hair and it loves you back” blogger contest and I cannot skip writing about my special needs daughter Farheena when it comes to loving the locks. She loves her long hair with her whole heart. 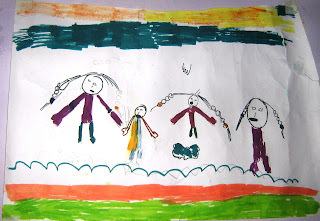 All of the pictures she draws usually have people with long plaits. She loves to decorate it with flowers too, unlike me. In return her hair loves her back. Other than the occasional dandruff, she faces no threats or problems from her hair. It grows fast, is thick and very smooth to feel. The knots in her long her open up quite easily; though, she makes a lot of fuss about it when I am trying to comb her hair. In her younger days, my family loved to give her different hairstyles with short hair. 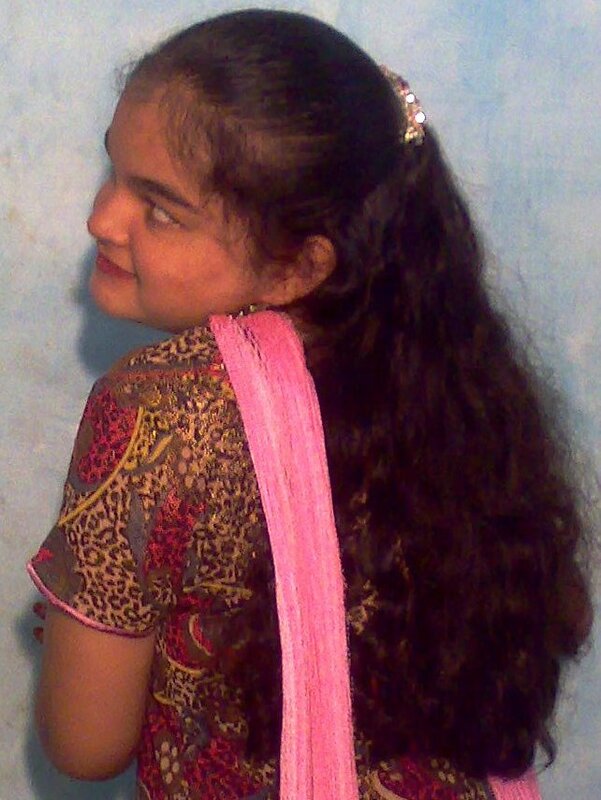 At the age of 9 she decided she wanted to grow her hair and have her hair flow long enough to reach her waist. I had to give in to her wishes and it was easy to give in, because I myself wanted her to have long plaits. Contrary to the city life, our lazy village life doesn’t allow me get professional pampering for her hair. All she gets is the Maa’s oil massage, shampooing and brushing. But that was enough to have her hair on a growing spree. Everything changed when I decided to visit USA and meet my friends over there. My friend Paula was totally smitten by Farheena’s hair. She loved to comb and decorate it in various styles. 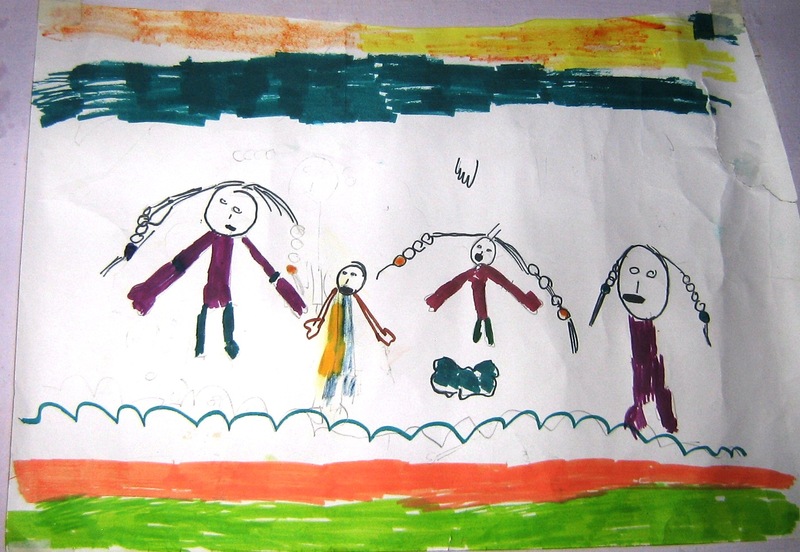 She was surprised to know that Farheena had never received any special treatment for her hair. So off she took her to Marie (a very good friend and Paula’s hair stylist) to show off Farheena’s lovely hair to to her. Marie in her turn ohhhed and wowed over it. Marie loved pampering Farheena’s hair and gave her an amazing new look. Farheena’s joy knew no bounds that day. We visited Marie once again after a few months and Marie enjoyed giving Farheena, who now a bit longer hair, a great look once again. All the time when Marie was working with Farheena’s hair, she was telling us about the Locks of Love, which is non-profit charity organization in USA. Locks of love accepts donations of human hair to make wigs for needy children who have lost their hair due to some medical condition. Farheena is a spontaneous person and once she makes her spontaneous decision she is kind of ‘Salman Khan’ person from the film Wanted. She herself cannot change the decision because it is already done and is in the past. 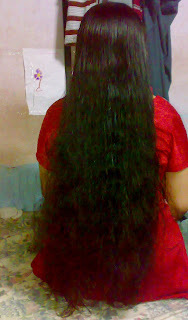 Farheena told me that she would love to donate her hair to locks of love that day, there and then. Paula tried to dissuade her but nothing worked. We needed the minimum of 10 inches hair in a pony tail for the locks of love. That would make her hair real short cropped. I was hesitant with that. Shoulder length was fine but up to the ears did not go down easily with me. But then Farheena being Farheena, insisted and had her way. It was a proud moment for all of us (Paula, Marie, Me, Rayyan and Farheena). She looked prettier and cute with her hair cut short. I could sense she missed her long hair but she knew that they would soon grow back again. Having gone bald and yearning for hair during my chemotherapy, I really felt good deep inside me that my daughter had the noble heart to donate her loving hair for the Locks of Love. It was another ‘WOW’ hair moment of our lives. The rest of her days in USA were spent with short hair. Paula would tell many of her friends how Farheena donated the long black locks to a good cause. 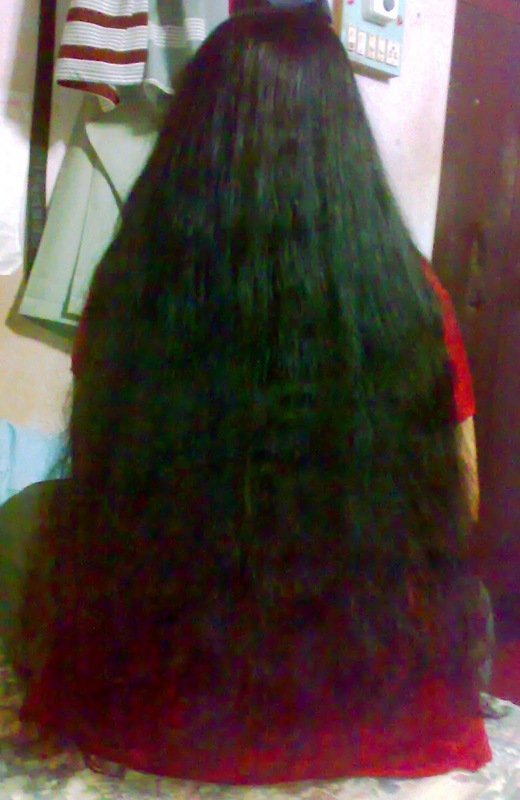 Her hair grew fast and was shoulder length in few months and now the amazing hair is quite long, touching the ground when she sits. I wonder how much more it is going to grow. Her lovely tresses open up and flow like silk all over her back. After a bath, when she sits under the fan for drying it up; it starts opening up and straightening itself so well, that I find it amusing just sitting there watching them. All I need to do is run a brush through it thoroughly after a while and plait it up. It has a good shine and is so smooth to touch. The pictures below will make you believe me! 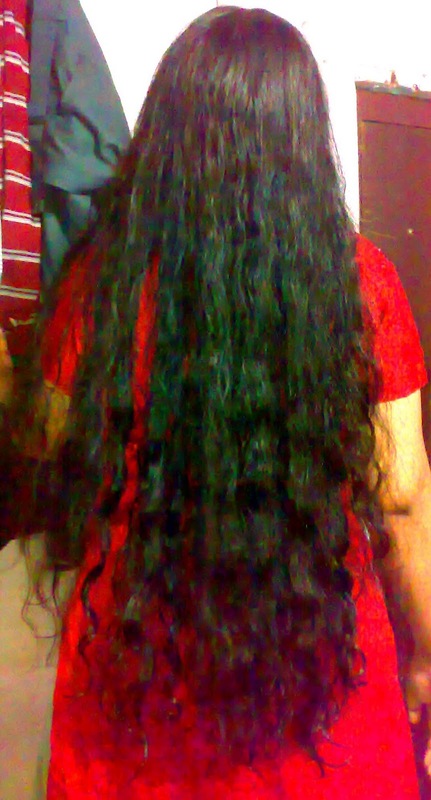 Farheena has the most beautiful hair I have ever seen and a heart that surpasses the beauty of her hair. I got to know about it when Locks of Love won the battle with her Love for Locks. I love her tresses so much! That was a sweet thing your daughter did. All the best for the contest. Very moving gesture by ur daughter ! i Guesss u would like this..if u like plz promote it..
excellent pictorial narrative. very well penned. Oh, your daughter has done such a kind deed at this age! :) God bless her. Best wishes for the contest. Being a special needs child has its own advantage. This is something I have learned while bringing up my daughter. She is different and in many ways, and being innocent and loving is included in that. That is a wonderful thing to have done. How many children her age would have done the same is a moot point. I can understand your pride at her gesture, especially since you had undergone chemo and lost your hair. All the best for the contest Farila. The contests are about winning prizes but your doughter has given gifts. And giving gifts is about being sublime from the humanity point of view. Thank you everyone for appreciating Farheena's spontaneous gesture. She is my special girl and has been a great guide to me. Bringing her up has been a great honour for me. oh Farida, once again.. you have found the most incredible way to describe your beautiful daughter and her beautiful ways. I knew when I read your title, this story was going to be great. But it is more than a great story.. It is a look into a life- and how much Farheena's young life has had opportunities to touch others with her generous heart. your photos are amazing!! And the generous heart of Paula.. which made my heart literally ache.. So, bravo, my friend.. a winner on so many levels. All I can say is how grateful and honored I am to read this and know that I have spent time personally with the IndieBlog Queen! hmmm giving ur precious thing is never a loss making deal :) inspiring act! God bless ur daughter! Excellent post with beautiful pictures of ur daughter. hope that u will promote my post..
Farida, that was an interesting post, good gesture by your daughter by donating her long locks for a cause. I am sure you are in for a prize in the contest. Congratulations in advance. Thank you everyone for those good words you have for my daughter. I feel so lucky to have her in my life. She makes one feel normal is boring LOL. I really enjoyed this story...maybe because I have three daughters who have lots of hair, too! One of them thought about Locks of Love, too, but then chickened out. She only cut 5 inches instead of 10. Nice to hear that our hairs have been appreciated ;). Our women have great fascination for long hair. 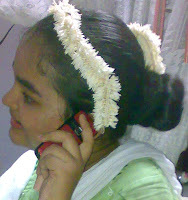 Decorating hairs with various kinds of flowers is kind of 'Must' in ceremonies though it is going out of style now. May be she will do it again someday. She has a big heart. I chickened out like your daughter too. Farheena has really beautiful hair.. and this is a beautiful post.. All the best..
My kids have learnt few things from me but then they have turned out much better than me in every way.. I am a proud Mom. Thanks for the compliments SIS. Very much inspiring for girls :) Keep it up ! Now that's a wow post!! 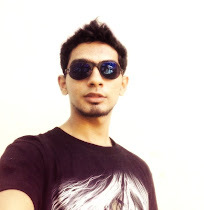 Thanks Prateek and Jaunty Anima. Congratulations, this has to be something, first surf excel and now dove! I wish I met Farheena and her mom....Like mom like daughter...I am going through your blog and salute you for being such a great mom.